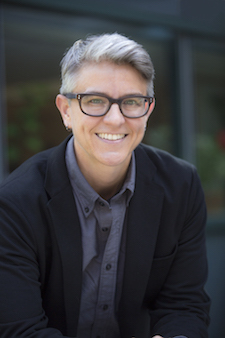 Sarah Bay-Cheng (pronounced Bay-JUNG, rhymes with "sung") is Chair and Professor of Theater and Dance, teaching theater history and theory, dramatic literature, and digital media performance. Her research focuses on the intersections among performance and media including histories of cinema, social media, and computer technology in contemporary performance. Publications include Performance and Media: Taxonomies for a Changing Field (2015) and Mapping Intermediality in Performance (2010) as well as essays in Theatre Journal, Theater, Contemporary Theatre Review, and Performance Research, among others. Her current book projects explore digital history and performance, and the history of experimental theatre. Bay-Cheng frequently lectures internationally and in 2015 was a Fulbright Visiting Scholar in the Department of Media and Cultural Studies at Utrecht University in the Netherlands. She edits the book series Avant-Gardes in Performance (Palgrave) and is an associate editor for the Journal of Dramatic Theory and Criticism, the International Journal of Performance Arts and Digital Media, and Contemporary Theatre Review. Previously, she served on the governing boards of Performance Studies international and the Association for Theatre in Higher Education, and she currently serves on the Executive Committee for the American Society for Theatre Research. Since 2016, Bay-Cheng can be heard monthly as a co-host for the podcast, On TAP (Theatre and Performance) with Pannill Camp and Harvey Young. She occasionally gets to work as a director and dramaturg with particular interest in intermedial collaborations and a fondness for puppetry. S. Bay-Cheng, J. Parker-Starbuck, D.Z. Saltz. Performance and Media: Taxonomies for a Changing Field (University of Michigan Press, 2015). S. Bay-Cheng, C. Kattenbelt, A. Lavender, R. Nelson, eds. Mapping Intermediality in Performance (Amsterdam University Press/University of Chicago Press, 2010). S. Bay-Cheng and Barbara Cole, eds. Poets at Play: An Anthology of Modernist Drama (Susquehanna University Press, 2010). S. Bay-Cheng. Mama Dada: Gertrude Stein’s Avant-Garde Theater (Routledge, 2004; pbk. 2005). S. Bay-Cheng, "Pixelated Memories: Performance, Media, and Digital Technology" Contemporary Theatre Review 27.3 (2017): 324-339. S. Bay-Cheng, "Digital Historiography and Performance" Theatre Journal 68.4 (December 2016): 507-527. S. Bay-Cheng, “Unseen: Performance Criticism in an Age of Digital Recordings” Theater 46.2 (2016): 77-85. S. Bay-Cheng, “Postmedia Performance” Interventions - Contemporary Theatre Review (May 2016). S. Bay-Cheng, “Virtual Realisms: Dramatic Forays into the Future” Theatre Journal 67.4 (December 2015): 686-698.